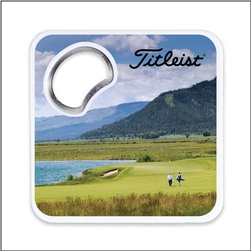 Order custom Imprinted Coasters with Bottle Opener and a magnetic back – perfect to advertise your food event or business. These coasters are durable – made of heat resistant plastic and come with rubber non-skid base. Magnetic for convenience. Bottle Opener constructed of nickel plate. Ordered via increments of 200.